Last week, before my speech at the University of Wisconsin-Madison, a man employed by the university (I will not say in what department) walked over to me, looked around to see whether anyone was watching and whispered in my ear, "I'm a conservative." This happens just about everywhere I speak. People whisper -- yes, whisper -- that they are conservative or they support Trump. The last time I experienced people looking around to check whether they were seen speaking to me was with dissidents in the Soviet Union. I have called contemporary conservatives in America Marranos, the name given during the 15th-century Spanish Inquisition to Jews who hid their Judaism while appearing to be Catholics, lest they be persecuted. I do not compare the consequences: Losing one's friends or employment is not the same as losing one's home or one's life. But otherwise, the label is apt. Why are so many Democrats shocked when a Republican is elected president? Because, as they themselves say, they "don't know anyone" who voted for the Republican. The primary reason for this is the people in their life who voted for Donald Trump -- professional colleagues, and even friends and relatives -- are afraid to tell them. There are two reasons the left labels most conservatives and all Trump supporters "white supremacists," "neo-Nazis" and "racists." One is to defeat conservatives without having to defeat conservative ideas. The other is to instill fear: Speak out and you will suffer the consequences. It is becoming more and more common for leftist mobs to gather in front of a conservative's home, scream epithets at the conservative's family members and vandalize the home. Just last week, the Associated Press reported: "Protesters are targeting the northern Virginia home of the National Rifle Association's top lobbyist ... Chris Cox ... as well as his wife's nearby decorating business. ... Libby Locke, a lawyer for the Cox family, said the vandalism included spraying fake blood and defacing the home with stickers." On May 24, 2017, Weinstein tweeted: "the police told me I am not safe on campus. They can not protect me." 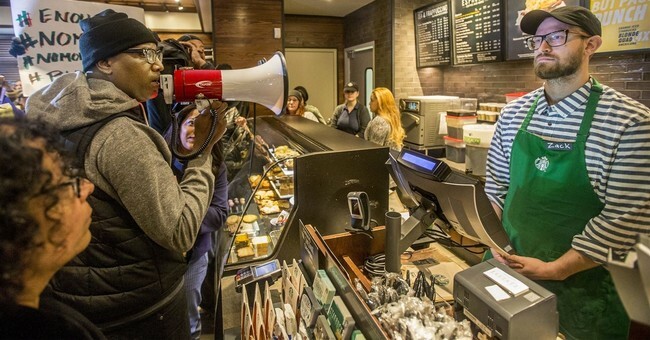 In the recent case of a Philadelphia Starbucks manager who asked two black men to purchase something before giving them the code to the restroom, Starbucks immediately appeased the left-wing mob. The company didn't wait until any facts came out; it simply abandoned the manager and announced it would close every U.S. store one day in May to educate all Starbucks employees about "unconscious bias." It does so in large measure because liberals are either too afraid to confront the left or they don't understand that the American left, not the American right, is the mortal enemy of liberalism.